This deep Chandra X-ray Observatory image shows the supernova remnant Kes 75, located almost 20,000 light years away. The explosion of a massive star created the supernova remnant, along with a pulsar, a rapidly spinning neutron star. The low energy X-rays are colored red in this image and the high energy X-rays are colored blue. The pulsar is the bright spot near the center of the image. The rapid rotation and strong magnetic field of the pulsar have generated a wind of energetic matter and antimatter particles that rush out at near the speed of light. 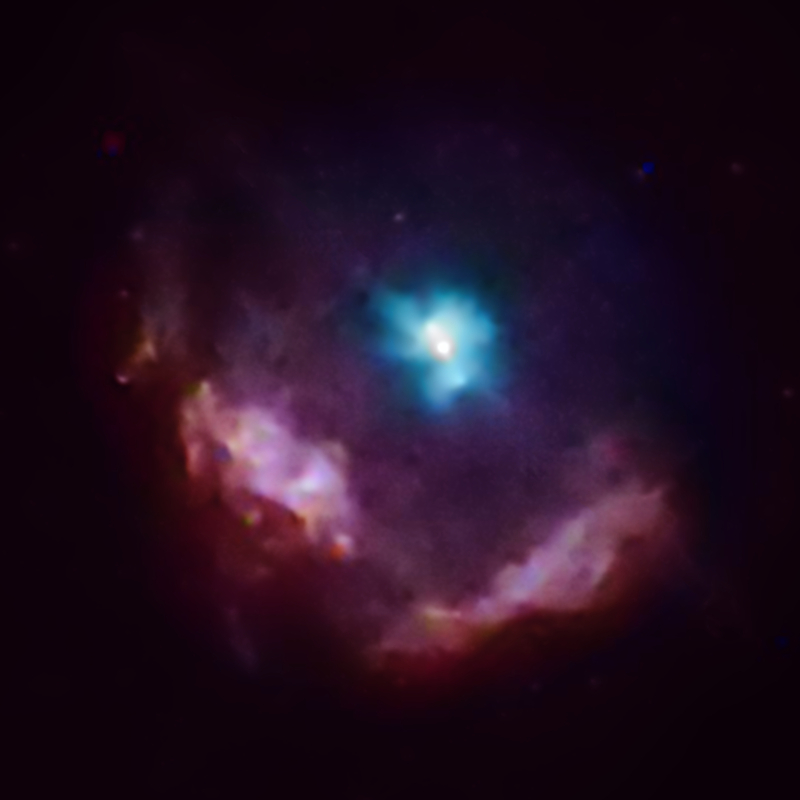 This pulsar wind has created a large, magnetized bubble of high-energy particles called a pulsar wind nebulae, seen as the blue region surrounding the pulsar. The magnetic field of the pulsar in Kes 75 is thought to be more powerful than most pulsars, but less powerful than magnetars, a class of neutron star with the most powerful magnetic fields known in the Universe. Scientists are seeking to understand the relationship between these two classes of object. 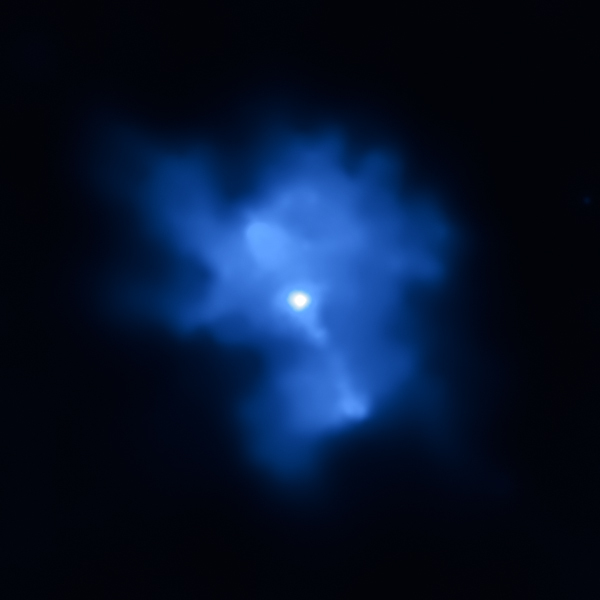 Using NASA's Rossi X-ray Timing Explorer (RXTE), Fotis Gavriil of Goddard Space Flight Center, and colleagues discovered powerful bursts of X-rays from this pulsar that are similar to bursts previously seen from magnetars. These bursts are believed to occur when the surface of the neutron star is disrupted by sudden changes in the magnetic field. These bursts were accompanied by magnetar-like changes in the rate of spin of the pulsar. Fortuitously, Chandra observed the pulsar near the time of the bursts and it was much brighter than it had been in Chandra observations obtained six years earlier. This brightening, and changes in the X-ray spectrum of the pulsar obtained with Chandra are also consistent with behavior expected for a magnetar. The behavior of this object may, therefore, fill a gap between that of pulsars and magnetars. Harsha Sanjeev Kumar and Samar Safi-Harb of the University of Manitoba have independently used Chandra observations to argue that the pulsar in Kes 75 is revealing itself as a magnetar. Scale Image is 4.5 arcmin across. Coordinates (J2000) RA 18h 46m 25.0s | Dec -02° 58' 30.3"